WorldCarFans has scored some spy shots of next generation Lexus RX SUV, which give some hints of what to expect in the vehicle’s future. Judging by the ill-fitting body panels and the extensive taping, the vehicle will be expanding in width and length. The cut bumpers and rear doors would indicate a shift in the front and rear axles, suggesting a longer wheelbase. Stylistically, we’re looking at a mule using the existing (but modified) RX body panels, so there’s no real hint of any exterior design changes, with the exception of the new rearview mirrors with inset turn signals. The new RX will also likely stay with its current 5-passenger capacity, since customers wanting three rows of seats can get that in the bigger Lexus SUV’s, the GX470 and the LX 570. Base engine will probably continue to be shared with the Toyota Highlander, that now being (for 2008) a 3.5 liter DOHC V-6 making 270 hp. The Lexus will likely also continue to offer a hybrid engine, the 3.3 liter V-6 which combined with its electric motors also makes 270 hp. 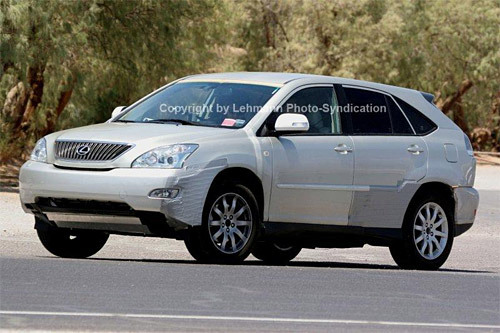 Lexus will be introducing an all new LX570 for the 2008 model year, so it is likely that a new RX350 won’t be scheduled until 2009. If you’d like to see more photos, be sure to visit the WCF site.